Deadpool is just a conduit for self serving comic in-jokes. Hmm. 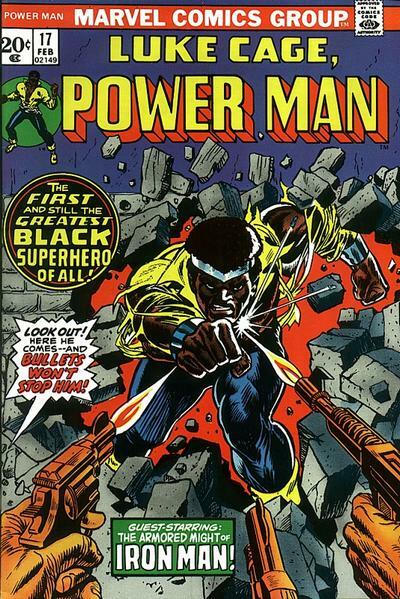 I think I'd prefer Luke Cage in his original boots for some reason. I think he can be funny when wrtten by the right person - Gail Simone or Joe Kelly for example. My top 3 characters I don't "get." I never "got" Deadpool or the Punisher, but for me Lobo has ALWAYS been DC's doppelganger for Wolverine, more or less. Since EVERYTHING seems to be more "cosmic" and more "powerful" in the DC Universe, DC's version of Wolverine would probably have to be a Superman-class brawler, expecially since DC doesn't really have anything that's equivalent to Adamantium. That's always been my take on the character, anyway. I never "got" Deadpool or the Punisher, but for me Lobo has ALWAYS been DC's doppelganger for Wolverine, more or less. Rather less than more! Altho Lobo was clearly DC's attempt to pump up a lame character, and turn him into their Wolverine, they missed the mark by several hundred lightyears. Alas, there were plenty of fans to pronounce Lobo "cool", simply because he was arrogant and "broke the rules", while possessing none of the depth of characterization Wolverine had developed over the years. When Lobo started using all those ropes instead of chains is when I thought they were pulling it back a bit, but it didn't stick. 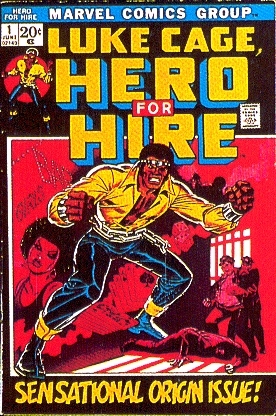 Back on topic...I thought Luke Cage's pants were blue - why do you want them black, JB? 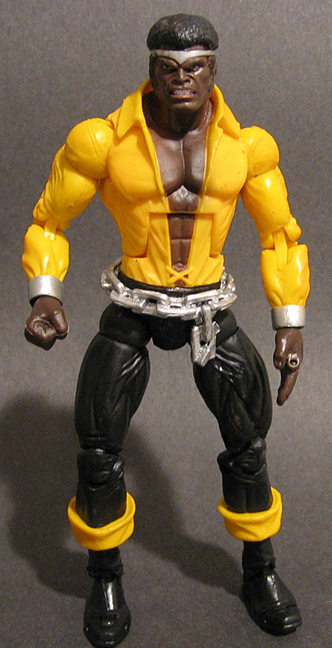 Luke Cage's pants were originally black, I'd forgotten about his boots. Yeah, isn't Superman and Wonder Woman's hair blue, too? I don't want to see this thread turn into another pointless "debate" over whether Spider-Man's costume is red and black, or red and blue, but it strikes me as curious that the painters of these little figures can look at, say, the Black Cat or the Black Panther and know that the blue on their costumes is not representative of the intended color, yet will look at Luke Cage and assume his tights are blue. And it can't simply be because those first two have "Black" in their names. They got the color right for Storm, Venom, Namor, Nightcrawler and the Super Skrull (tho they did get it wrong on Nick Fury). 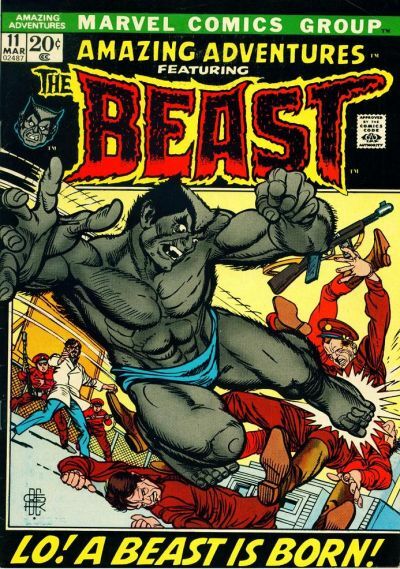 What color is the furry Beast? Originally gray, then blue, As stated in the comics. Luke Cage can't change his pants from time to time? Simple reality, Luke's tights turned "blue" for the same reason the black parts of Spider-Man's costume and the original X-Men uniforms (not to mention Batman's cape and cowl, among others) turned blue ---- spotting blacks takes time, and in comics, with deadlines every chasing, it's all about time. Eventually, the version that is technically wrong becomes the norm, and we end up having discussions like this. Wonder Woman's mother became a blonde for the same reason. Darkseid's arms and legs turned purple, and I actually had to fight to have them restored to their original grey. Northstar and Aurora end up with white hair, Storm with a white costume. Etc, etc. Would Captain America? The costume is a costume, not street clothes. It's Luke's way of "branding". Can we not even link to a cover in wikipedia? What part of "The JBF is a Wikipedia-Free Zone. Any posts that link to or take information from Wikipedia will be deleted no matter what their content. " do you not understand? As I mentioned after double-checking the rules and edited in my above post, "nevermind." Gotta love that time and date stamp! Yes, it is good to see when a post is edited. Mind-reading aside, thatdoes not change that I went to check the rules again, saw that all wikipedia was off limits, and edited my post accordingly after noting your friendly reminder that followed.